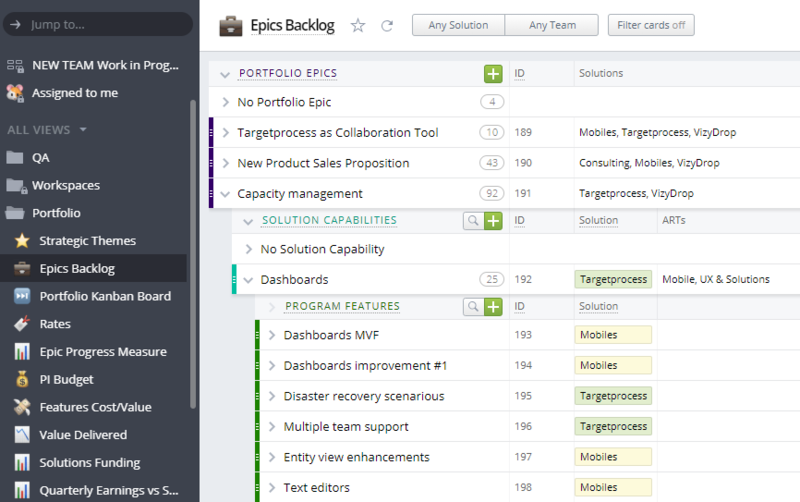 With 3.13.0 we've introduced an additional level to the work hierarchy named Portfolio Epics. This is a new entity type above an Epic in a Project. It’s supposed to be used for portfolio level planning and would be split into Epics and Features. Portfolio Epics are very similar to Epics. You can assign several Teams, customize States and Fields, create Metrics, etc. Taking into account that such a work item's implementation occurs over several Releases or Project increments, Portfolio Epics do not support Release/Iterations/Team Iterations planning. Also there is no history tracked for Portfolio Epics yet, but it’s being implemented and will be released soon. To enable Portfolio Epics, you will need to go to the Settings of the required process and find a new option in practices list. From now, a Feature can be linked to a Team Iteration in the same way a User Story, Bug, or Test Plan Run can. It’s possible to set Team Iteration for Features either manually or to calculate as the Team Iteration of the latest User Story in the Feature. 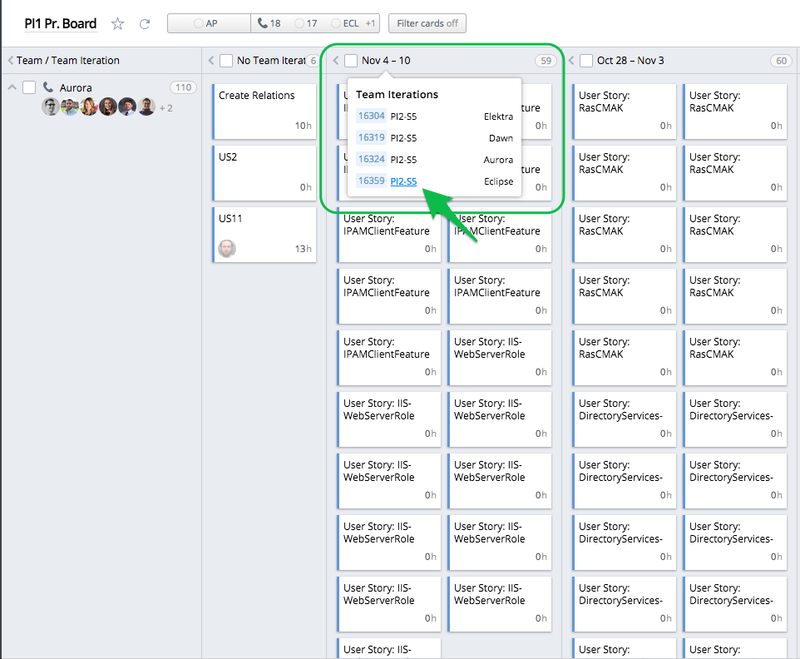 So you can plan Features by Team Iteration then build views with Features cards and Team Iterations as an axis, etc. We’ve added a relationship between Team Iterations and Releases. A Team Iteration may be linked to any Release which is linked to the same Projects as work assigned to the Team Iteration. It’s also possible to use Team Iterations without linking them to Releases as before. Please do not use this new feature of Team Iterations along with standard Iterations as they are also linked to Releases. 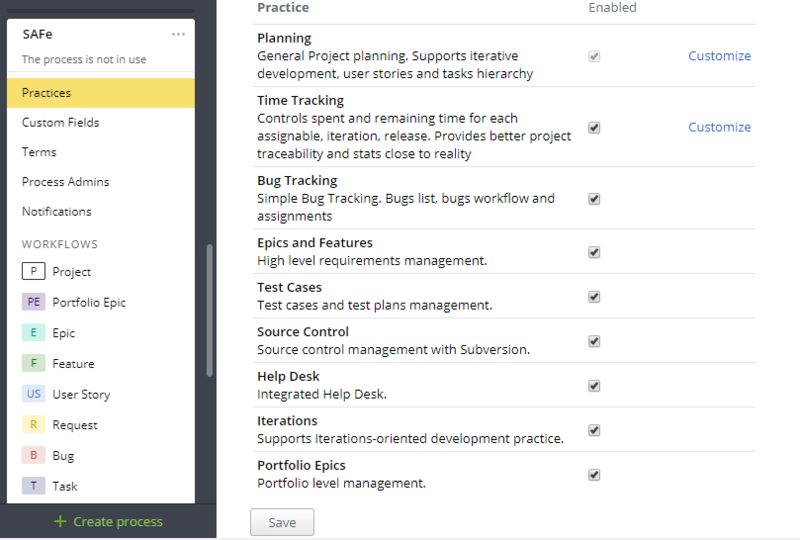 Now it is much easier to plan work items, that have interdependencies into Team Iterations, Iterations, and Releases. Targetprocess will help you to identify any planning problems while in a board view. The relation lines of "blocker" and "dependency" types will be highlighted in case of planning issues. Let say, we have 2 teams: back end team "Aurora", and front end team "Elektra". A new feature involves some User Stories for the back end team and some for the front end team. Front end team "Elektra" is blocked by team "Aurora", since they can start only when back end work is finished. We can add a "dependency" type relation between these dependent work items in Targetprocess. If we plan work by Team Iterations, the system helps us to identify if the sequential logic of planning these dependencies is broken. If team "Aurora" plans User Stories later then team "Elektra" - system will show this planning issue. If you work with SAFe and need to create a sequence of Team Iterations for all the Teams that plan their work together, or you just want to create a bunch of Team Iterations for all the Teams in a Project, it could be a nightmare to add 20, 50, or even more Team Iterations at a time. A new capability has been added in Targetprocess that extends the default Global/Quick add functionality. If you need this extension, please contact Targetprocess support team, and we will replace the default Release quick add form with extended one. The system will calculate Release end date automatically and will create a sequence of Team Iterations that go one after another for every Team in the selected Projects. As you know, Targetprocess provides the possibility to group the Team Iteration axis for convenience. Now we made one step forward and replaced the long list of Team Iterations names in the header into 1, but useful. The start and end dates will be displayed in such a case. If you want to jump to some particular Team Iteration or Team view just click on the header and then on the necessary link. We have added support of a default process terms in DSL filters. It’s possible to use default process terms in card and axis filters in view settings, lookups, etc. This feature is disabled by default, please contact our support team if you would like to enable it.